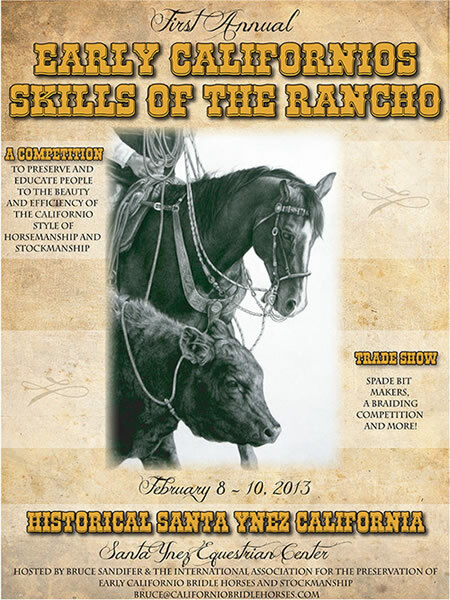 In just a few weeks, the first annual Early Californios Skills of the Rancho will be held–February 8-10, 2013 at the Santa Ynez Equestrian Center in Santa Ynez, California (195 North Refugio Road, 93460). It is a competition with a purpose. 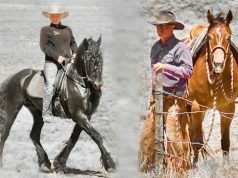 The new association website (www.californiobridlehorseassociation.com) states that its primary mission is “to preserve and protect an essential and threatened part of both California and western United States history: the method of horsemanship and stockmanship developed by the early Californios.” This new competition being unveiled next month will provide a venue and a judged event to bring together many great horse folk to display their Californios horsemanship and stockmanship skills in a fun atmosphere to educate people about these traditions. The organization’s website has a wealth of information about the event including the rules, event descriptions, a listing of the entries, nearby hotel information, a list of vendors, and how you can become a member or sponsor. 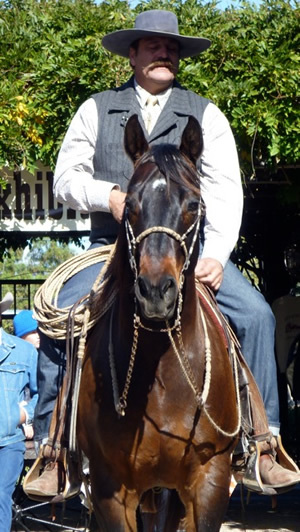 Both the event and the educational organization, grew out of Bruce’s desire to present the authentic early Californios style of horsemanship to the public, do it in the very region in California where much of the tradition developed, and promote its longevity. 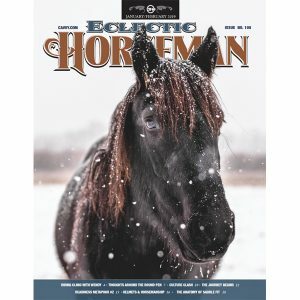 It’s a challenge Bruce already endeavored to pursue in other ways for many years—a point which he discussed in detail in an interview with Eclectic-Horseman back in the September/October 2012 issue (Number 67). 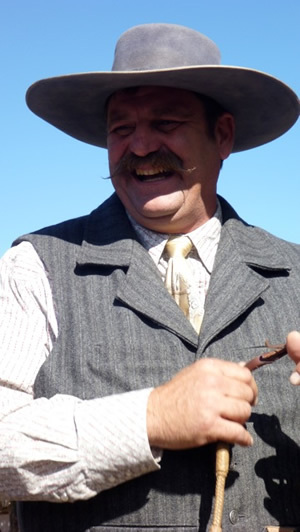 He says it was growing up in Montana and developing a fondness for the Californios ways through reading Ed Connell’s books beginning at age 12 that set him on this trail. Some decades later, he’s as passionate as ever about passing on these traditions to new generations. “It’s a free event for spectators—there’s no admission,” Bruce says. “There’s going to be a lot of great vendors. Food will be there. There going to be some music and stuff going on around town at the same time, and at the event. It might take several years [to become established] but we wanted to get started off. If we can make it work without charging the public to come in, we want to do that to keep promoting it. 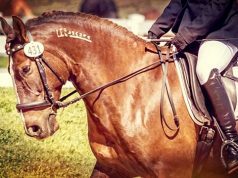 So what we’re trying to do is make it accessible, bring people in who are horse people that are interested in doing something with their horses that’s very doable for most people. 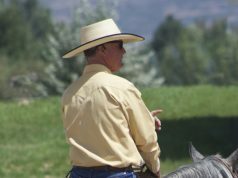 The goal of the organization is to not only educate but also get people involved in this type of horsemanship. Entries to compete in this year’s event just closed on January 5th but Bruce says most of the categories were filled up before the deadline. Not bad for any event, let alone something brand new. “We’ve got 15 Open teams and 15 Pro-Am teams,” he says. “So, we’re going to have a good selection. We’ve been getting a lot of donations of prizes. Then I went out and got several different silver smiths to do some work for us as prizes—keeps people interested. We’ll do demonstrations as we’re explaining the rules. So, we’re going to go in there and tell people, ‘Okay, this is kind of what we want to see.’ We’ll explain each aspect of it as we go along and we’ll explain that, not only to competitors, but also to the crowd so they understand what we’re looking for for the judges, and what we’re looking for overall. “The whole thing about the Californios system is that it’s a fully balanced system. 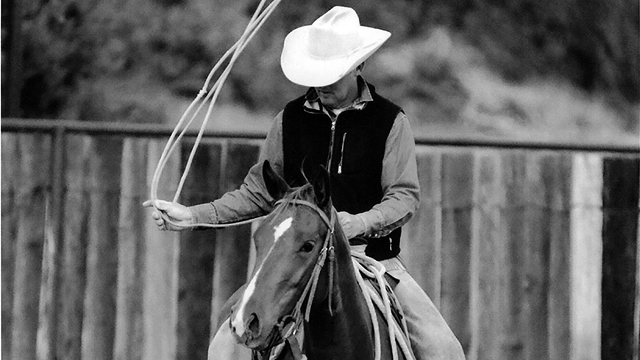 Not only is the horsemanship created through balance but every other aspect—the roping, the stock handling, and all that—are also balanced, too. Everything works together in this circle. And one piece is not effective without the others, really. The Internet scuttlebutt has been the main driver of getting the word out about the upcoming event, according to Bruce. 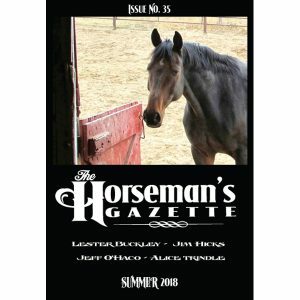 Also, he explains that publications like Eclectic-Horseman which devote time and space to these traditions have been instrumental in getting interest going both in the Californio style of horsemanship and the competition event. “If nothing else I think it will be a real fun event,” Bruce says. “There’s enough things for people to do that they’ll be entertained and they’ll have a good time. I think if we keep it not too serious, you know–that’s the whole thing, we don’t want this to become where people get nervous about coming in there and roping and doing skills and stuff like that. We just want them to enjoy it and enjoy the moment. 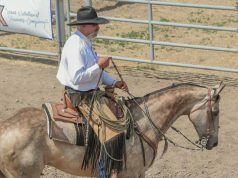 Folks can join the Californio Bridlehorse Association to be kept up to date on all the various plans to develop and continue educational outreach for these horsemanship traditions.